Smooth + Control or Volume + Shape. Brand new, impossible to find! A styler that is engineered for multiple hair types and styles, featuring Coanda air styling and propelled by the Dyson digital motor so users can curl, wave, smooth, and dry with no extreme heat. Attracts and wraps hair, using only air. Explore the range below and find the right Airwrap styler for your hair type. Dyson Airwrap Smooth + Control styler for frizz-prone hair. 1.2 inch Airwrap barrels engineered to create voluminous curls or waves. 1.6 inch Airwrap barrels engineered to create loose curls or waves. Firm smoothing brush engineered to smooth and control frizz-prone hair. Pre-styling dryer takes hair from wet to damp, to prep for styling. Storage case neatly stores your Dyson Airwrap styler and its attachments. 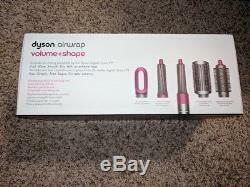 Dyson Airwrap Volume + Shape styler for fine, flat hair. Soft smoothing brush engineered to gently align and smooth fine hair. Round volumizing brush- engineered to volumize and shape fine, flat hair. The item "Dyson Airwrap Styler Straightener Curler Smooth Control or Volume Shape NEW" is in sale since Friday, November 30, 2018. This item is in the category "Health & Beauty\Hair Care & Styling\Straightening & Curling Irons". deals" and is located in Houston, Texas. This item can be shipped to United States, Canada, United Kingdom, Denmark, Romania, Slovakia, Bulgaria, Czech republic, Finland, Hungary, Latvia, Lithuania, Malta, Estonia, Australia, Greece, Portugal, Cyprus, Slovenia, Japan, Sweden, South Korea, Indonesia, Taiwan, South africa, Thailand, Belgium, France, Hong Kong, Ireland, Netherlands, Poland, Spain, Italy, Germany, Austria, Bahamas, Israel, Mexico, New Zealand, Singapore, Switzerland, Norway, Saudi arabia, Ukraine, United arab emirates, Qatar, Kuwait, Bahrain, Croatia, Malaysia, Brazil, Chile, Colombia, Costa rica, Panama, Trinidad and tobago, Guatemala, Honduras, Jamaica, Uruguay, Viet nam, China, Barbados, Bermuda, Brunei darussalam, Bolivia, Ecuador, Egypt, Gibraltar, Iceland, Jordan, Cambodia, Cayman islands, Sri lanka, Luxembourg, Nicaragua, Oman, Peru, Pakistan, Paraguay, Reunion.